Add him to your watchlist — they already did. In a new topical weekly show, comedian Hasan Minhaj will cut through the noise and explore the modern cultural and political landscape with depth and sincerity. New episodes, new topics, every Sunday. 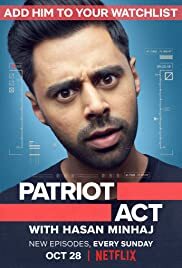 Patriot Act with Hasan Minhaj premieres October 28.